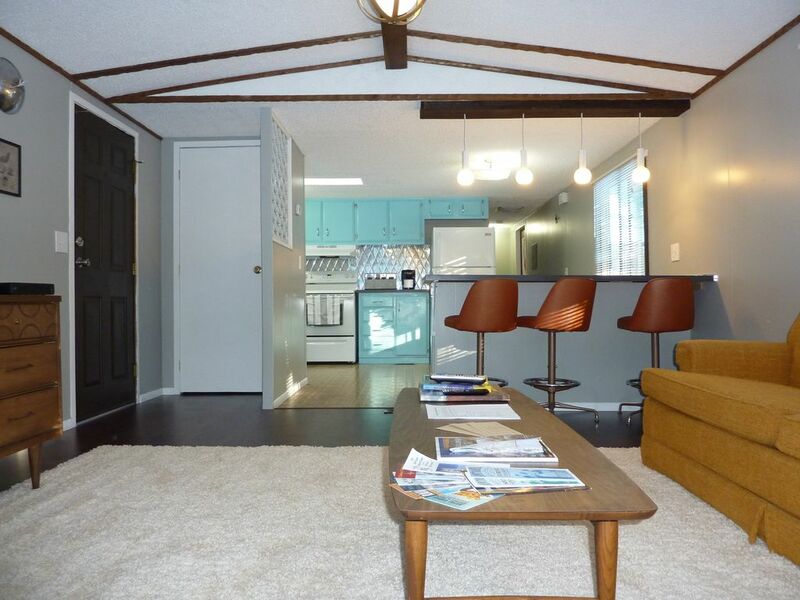 The period correct accents and attention to detail in this Vintage Mobile Home will blow you away. Located at the end of a dead end street that was recently paved it makes for a secluded, private, getaway in a small, tree filled, mobile home park. Located only minutes from shopping, dining and outdoor adventures this mobile home is the ideal place for a quiet night yet still close to everything you would want. Keurig Coffee Maker with 3 kinds of sweeteners, coffee (regular and decaf) and creamer. Chips, fruit, coffee, tea, and bottled water for your arrival. Local magazines and brochures are provided and also available when checking in at our store. We really enjoyed our stay in this vintage mobile home. The owner was very responsive and the park manager on-site if we needed anything. Quiet little mobile home park, close to town. Very clean and welcoming. Barna and Erin were great and quick to answer any questions....would stay again! Clean, well maintained, very nice. Barna is a wonderful property owner and maintains and excellent property in a nice, quiet, and private small trailer park. James, his manager, is extremely helpful and well-mannered. The trailer is clean and beautifully restored. I enjoyed my stay here and would highly recommend this property!! !